When my daughter got her phone, we were given a choice of phone numbers. We couldn’t believe our luck when one of the options for the last four digits was 1042! Any camp-loving soul would easily recognize and never forget that number (a.k.a. 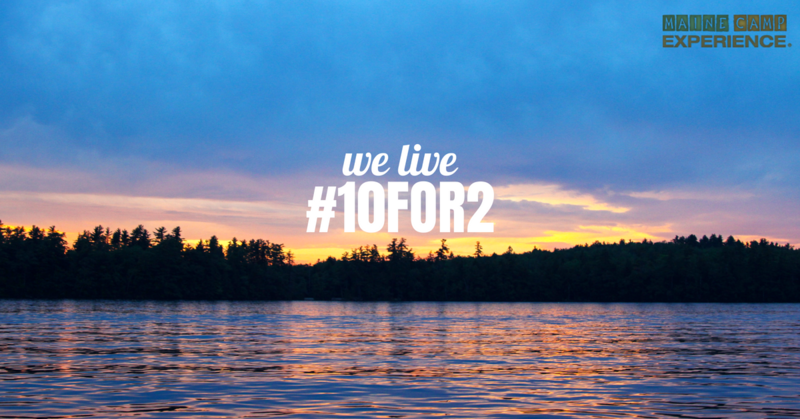 #10for2 or #ten4two) because it’s the universal sentiment among Maine Camp Experience (MCE) campers and staff. They live 10 months during the year for the best 2 months – their summer camp season! The countdown: Ask any camper kid how many days till camp and they’ll tell you exactly or close to the number of days till opening day. While this would seem obvious for a month or week before, our Maine campers start counting the day they leave camp one summer already anticipating the next. While 300 or 200 days could seem daunting, it gives kids something to look forward to. And, while we encourage kids to engage in their home lives, it’s nice to know – during cold winter months or any challenges that may get you down – that camp will come again. Freedom from school and home schedules: The school year is jam-packed with long school days and homework, and frequently layered with a multitude of after-school and weekend activities ranging from sports classes and games to art lessons, academic tutoring, religious school, and more. Camp is a great time for kids to refresh. The chance to be in a beautiful place: What could be better than spending a summer at a camp on a beautiful lake in the “Pine Tree” state?! Every MCE camp is situated on a beautiful lake and offers opportunities ranging from sailing and paddle boarding to water skiing, swimming, canoeing, and more. Campers smell pine in the air, hear calls of the loons, and may even glimpse a moose. There is something so calm, peaceful and beautiful about enjoying Maine at camp and while on incredible out-of-camp trips. The time spent with camp friends: There is something very special about having camp friends who are separate and different from home friends. Camp friends live with each other day in and day out, and they really get to know each other well. Camp friends love and support each other during camp and throughout the year – sometimes at meet ups, or even just a phone call or FaceTime away. The friendships deepen summer after summer at camp, and many continue through college, careers, as apartment roommates, and beyond. A camp friend is a “sister” or “brother” for life. The camp activities and traditions: Many campers will sing their camp and Color War songs throughout the school year and for many years and decades beyond. These anthems, which become forever ingrained in hearts and minds, represent such poignant memories of fun times at camp. Special traditions like Rope Burn, Sing, Silent Dinner, Dance Shows, plaques, intercamp games, intracamp leagues, and July 4 celebrations, as well as activities in every day schedules in sports, arts, adventures, and nature, are all wrapped into one, incredible summer camp package.